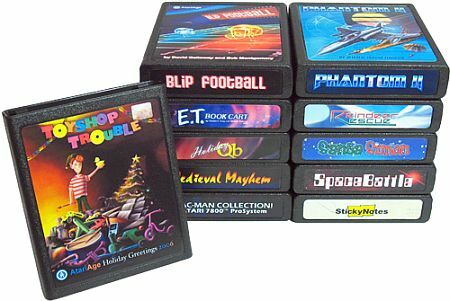 The Atari community has had a busy year developing all new homebrew games for the venerable Atari 2600. These are real Atari games mind you - not emulated through Flash, or a modern console borrowing the "look and feel" of the classic games... these games come on real cartridges that plug into your 2600. Atari Age is offering special sale prices on many homebrew games through the 15th of January, with some orders even qualifying for a free game. If you haven't tried a homebrew title on your Atari console, you're missing quite a party. It takes real programming chops to make a fun game fit in the scant memory of a 2600. You can also benefit from the progress in programming technique since the 70's that allows new games to blossom in ways Atari's original designers could never have dreamed of. The photo above shows some of the new additions to the Atari Age catalog, but there are plenty of other releases in the AA store to browse through. Don't forget to check out some of their more unusual items like an Atari speech module, rare holiday carts from prior years, collecting supplies, even music CD's!